Facebook today launched its mobile ad network called Facebook Audience Network so developers can make money without having to sell their own ads, do their own targeting, handle measurement, or route payments. Facebook will take care of it all. Just as my scoop said, developers can integrate a tiny bit of code to run FAN in banner ads, or they can work directly with Facebook to create native ad units that feel like a natural part of their user experience. Facebook says developers can sign-up for Facebook Audience Network or talk to their ad rep about getting early access. The program will rollout over the “coming months” and will start with advertisers interested in buying app install and engagement ads. Facebook will take a cut of what advertisers pay and hand the rest to the publishers, those the company wouldn’t reveal exactly how much its cut will be. Eventually Facebook plans to expand FAN (my unofficial acronym, not Facebook’s) to serve businesses with other marketing objectives, perhaps including website traffic or ecommerce purchases. Existing Facebook advertisers can start pushing their ads to Audience Network with a single click since they use the same creative as News Feed Ads. FAN will be available through all of Facebook’s ad interfaces and the Ads API. Facebook says to expect some variable performance at first. To protect users, Facebook’s Audience Network policies say publishers can only show one ad on the screen at a time. Publishers can’t disguise the ads in their interface, place them over buttons to score accidental clicks, or make clicking them the only way to exit a screen. Facebook notes that by integrating the Facebook SDK or working with a measurement partner, advertisers can track engagements and conversions driven by FAN ads, plus demographic info and other stats about their audience. Publishers can filter what categories of ads appear in their apps, so they can reject health, gambling or financial services ads but allow ones for food, education, or gaming companies. As for privacy, some users may not be excited about having their Facebook data travel around the mobile app-sphere to target them with ads. Facebook Audience Network doesn’t actually give advertisers or publishers people’s personal data, it just serves them ads that match. However, if users want to opt out, they can. On iOS go to Settings->Privacy->Advertising and enable “Limit Ad Tracking”. On Android, go to Google Settings and opt out of interest tracking in the Advertising ID options. 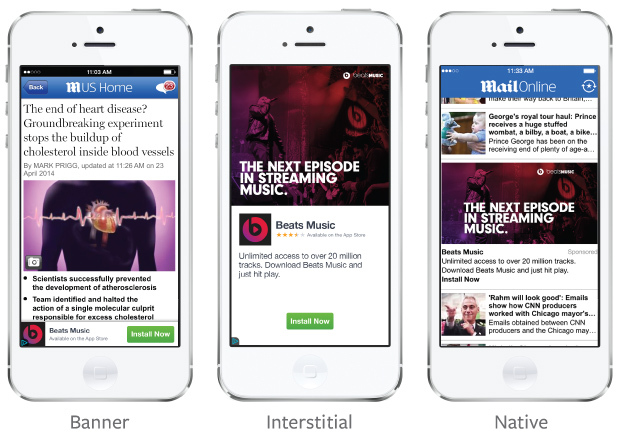 Facebook first tested it mobile ad network in 2012, but paused it soon after to focus on its own native ads. At the time, the mobile ad network didn’t earn much money for Facebook because it merely a targeting layer that sat on top of ther ad networks that also took a cut. In September 2013 Facebook rebooted the tests, but instead of a layer it had evolved to be a full fledged ad network that works directly with advertisers and publishers. This lets Facebook earn a higher margin. COO Sheryl Sandberg said the ad network tests “show a lot of promise and we’ve gotten good feedback from marketers” on Facebook’s recent Q1 2014 earnings call. Re/code’s Mike Isaac reported that Facebook would officially launch the ad network today, and I confirmed the news with additional details including the name Facebook Audience Network and the fact that it would be compatible with both standard banner ads and custom native units.Now we have the first official look at Facebook’s mobile ad network. The product will compete with other ad networks like InMobi. [Update: However, FAN will not compete with mediation services Twitter’s MoPub. Instead, it can tap into it to simultaneously show ads from FAN and other ad networks. You can read more about how FAN and MoPub play nice in our follow-up article.] While it may take a few quarters for FAN to spin up, it could become a serious source of revenue for Facebook. The launch represents a big shift in how Facebook’s business works, from monetizing engagment on its own properties to earning money from its ad targeting data elsewhere. Until now, Facebook’s revenue has essentially been directly proportional to how many ads it showed in the News Feed and how many users visited. The ad network will let it grow revenue without cluttering its own site and apps with more ads. That’s a more sustainable model that insulates Facebook from competition or a slow down of its own user engagement. If users are lucky, Facebook might earn so much from its Audience Network ads shown elsewhere that it could show fewer on its own apps and sites.